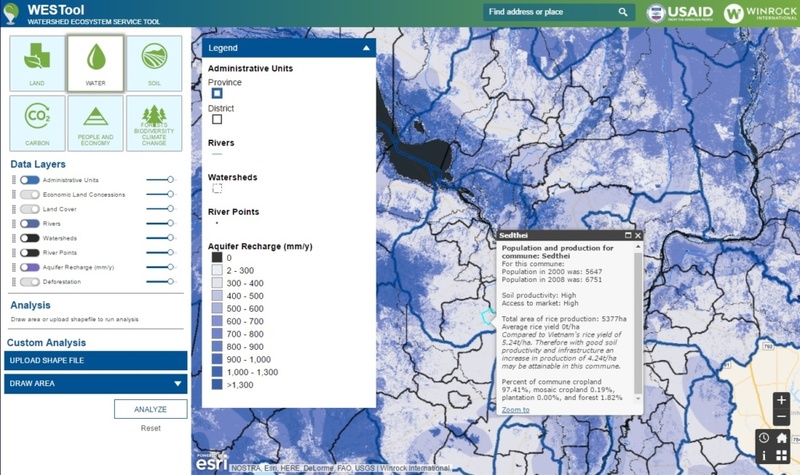 Blue Raster is proud to announce a partnership with Winrock International that has resulted in a completely redesigned Watershed Ecosystem Services Tool (WESTool), allowing users to explore the interaction of ecosystem services, land uses and socioeconomic factors across Cambodia’s landscapes. By combining advanced science with intuitive maps and tools, the WESTool offers valuable information at the local, regional and national scale to support decision makers and land managers who wish to understand and balance the value of remaining forests with development goals. The WESTool estimates land use change, carbon stocks, greenhouse gas emissions, sediment and nutrient loss, changes in river water quality, impacts on biodiversity, population, access to market, and general agricultural production data at the national and local levels in Cambodia. This provides a valuable resource for anyone interested in learning more about the the impacts of land use change on forest ecosystem services, people and the economy in Cambodia. The tool provides for a more comprehensive understanding of the implications of land management decisions by offering information on both the historical impacts of land use change and the current value of ecosystem services.